I seem to have developed Critics’ Disease. 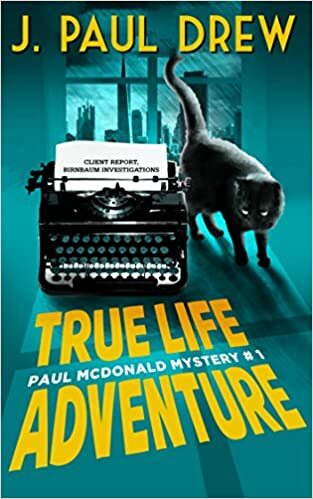 I’ve become so obsessed with technical and artistic excellence in literature that, when presented with a perfectly pleasant little light mystery like True-Life Adventure, by J. Paul Drew, I find myself inclined to grouse. Even though I have no excuse for doing so. This is the first book in a series, and various clues (such as a lack of cell phones) indicate that it was first published back around the ‘80s. The hero is Paul Mcdonald, a reporter who left his steady job to write mystery novels. Which he hasn’t succeeded in doing. Instead he gets by writing reports for a real private eye. But one day the private eye dies of poisoning while dictating to him. Paul, realizing that a true mystery has fallen into his lap, decides to investigate it himself so he can write it up and get it published. This leads him to the detective’s last case, involving the kidnapped daughter of a computer mogul. The tone is light, with lots of wisecracks. Wisecracking, of course, is a hallowed tradition in detective novels, so that’s not a real criticism. I guess I’ve grown to expect some kind of serious underpinning in stories involving human deaths. Also, I found it a little hard to buy the scenario where a depressed, overweight guy somehow snags a hot girlfriend much younger than himself (I grow less tolerant of such plot lines, for some reason, as I grow old alone). But I really have no reason not to recommend True-Life Adventure to you as light summer reading. Nothing really wrong with it.